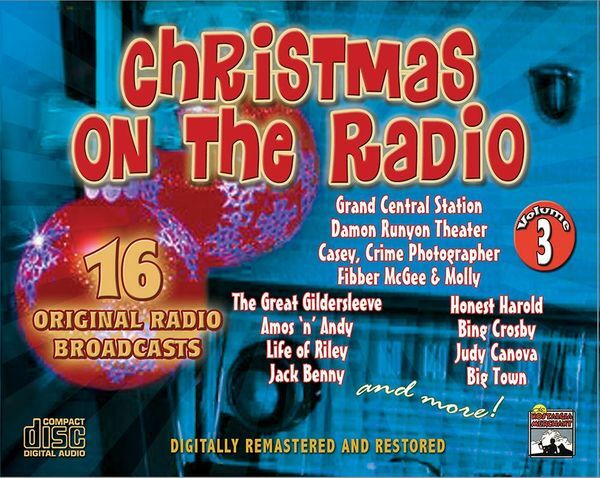 Relax in your favorite easy chair and enjoy these great old time radio Christmas classics. Or if you’re taking a trip to Grandma’s house for Christmas, take along this collection and enjoy Christmas cheer as you travel. These classic radio shows will take you back to a simpler time, when familes gathered around the radio to listen to their favorite shows. Back then, Christmas was a special holiday. It didn’t start in September, but a few days before the big day. Jack Benny - Christmas Shopping - 12/22/40: Fibber McGee & Molly - Fibber Cuts Down a Christmas Tree; Author’s Playhouse - Christmas - 12/21/41; This Is My Best - The Plot to Overthrow Christmas - 21/19/44; Christmas Special - The Greatest Gift - 12/24/46; Burns and Allen - Last Minute Christmas Gift - 12/18/47; Great Gildersleeve - Leroy’s Christmas - 12/24/47; The Lone Ranger - Mission Bells - 12/24/47; The Bob Hope Show - Christmas Shopping 12/7/48; My Friend Irma - Irma’s Christmas Party - 12/20/48; Life With Luigi - No Gift for Pasquale - 12/20/48; Family Theater - The Other Wise Man - 12/14/49; The First Nighter - Christmas - 1949; Yours Truly, Johnny Dollar - Department Store Swindle - 12/24/49; Red Skelton - Juniors Christmas Play - 12/23/51; Phil Harris-Alice Faye Show - Stolen Christmas Presents - 12/23/51.